wer is a 4-way drilled bead, available in various sizes and usually made of clear plastic. The main line runs through one hole, and your dropper runs through the other, at right angles. You will need to anchor the bead on your main line, either with permanent stop knots or sliding stoppers so you you can adjust the distance off the bottom. The dropper only needs one stop knot to keep it on. If you are using the larger size beads and a light dropper, you may find your knot pulls through the hole in which case add a tiny bead between the 4-way bead and your knot. This rig is light, nearly invisible and best of all, free to spin in all ways so your line will rarely tangle. By which I mean the weights at the bottom of your string of feathers. Mackerel being competitive predators, are always on the lookout for some action and the sight of other mackerel chasing something will bring them over. If they can’t see your feathers in the murky depths but do catch sight of what looks like a mackerel’s belly diving and turning, guess what they’ll do. Come on over of course. The easy way to simulate this is to paint your weight white. This will last one session tops, so for a more durable finish, use vinyl powder paint. This is more fiddly to apply as it involves heat, but it forms an instant vinyl skin around the weight and should last a lot longer. UK Hooks sell it very cheaply, and for less than £2.50 you can coat more weights than you will ever use in a season’s feathering…. Postscript: last season I tried using a pirk as a weight – this adds even more attractiveness, and can catch the bigger fish too. Mackerel traces are a devil to store once they have been taken out of their bags. I have tried trace winders – but the hooks spring out and snag. I have tried hanging them in the cabin between trips, but somehow they get off their hooks in the night and snag on things just to be awkward. I think I now have the answer. M y kids were throwing out one of those long sausage floats they use as a swimming pool toy so I blagged it off them for £1. It’s basically a long rod of dense foam, you can buy them cheaply enough in Toys’r’Us. I sliced it into short lengths, and wrapped the traces around, burying the hooks in the foam to keep them under control. So far, no midnight escapes! If you can’t find these foam sausages, pipe insulation from B & Q would work just as well. The picture shows the principle, in fact a length like that would store at least three traces. In the photo above you can see the corner of another “find” from the stuff my kids were chucking out. This is a plastic lunch box, with a snap fastening. Luckily with no cartoon characters or Barbie on the front! It was the perfect size to hold 8 spools of line, labels up so I can see which is which. Better yet, it was thrown in for the same £1. Flashers and dodgers are used extensively in Canada and parts of the USA, but I have never seen them used in the UK (except off the stern of Salar). Flashers and dodgers are a collective term for a device attached to the line above a lure to impart additional attraction when trolling. They take the form of a plate of shiny material – metal or plastic – which is bent into a very shallow ‘S’ shape. These devices can be as small as 20cm long or as large as 50cm, and come in many different colours and styles. As they are trolled through the water, they dart and flash like a predator chasing bait fish, and this attracts other predators. Flashers and dodgers can be rigged in two ways, according to the lure you are using. If the lure has little or no action like a dead bait, soft plastic or a muppet, the lure can be rigged to run as close as 1m or less behind the flasher. The movement of the flasher will impart movement in the lure as it snakes about. Flashers that rotate need several good quality ball bearings in line to ensure the line does not twist into a huge knot. If the lure has its own action, like an eddystone eel, toby lure or rapala, the line from flasher to lure can be up to 2m. Do they work in the UK? Yes, of course – bass and mackerel are shoal predators and are attracted to other predators having a scoff, and in clear water the flash from a flasher will be far more visible over a distance compared with the lure on its own. The only slight downside is the drag from a flasher will trip a diving vane, so you need to use a weight to get the flasher down to the required depth, and if that depth is more than a few feet the amount of weight will mean you cannot fish ultra-light. The other downside to any inshore trolling in summer around the eastern Solent is the floating weed, which will collect on a flasher, weight and lure within seconds. You will have to pick your season or location, but it is worth a try. When loading a reel with line it is often difficult to maintain an even tension as you spool the line on. Here is a very simple trick. Go and find your Yellow Pages phone directory, open it at “M”, put your line on the page and close it. Reel your line in and the pressure of the pages will tension the line. Too much tension? Run it through “D”. Not enough? Run it through “T”. You get the idea! Method 1: Take a paper bag and put a rock in the bag with your groundbait. Tie the neck of the bag with cord, and lower the bag to the bottom. Give the cord a jerk and the rock will burst through the bag, deposit the groundbait and let the cord float up to the surface. Remember to take plenty of rocks and bags – you only get to use them once! The paper bags soon dissolve in water. Method 2: Tie a 2lb weight or similar to the end of a strong line. Put a carrier bag around the weights and tie round the outside above the weight to hold it in place. Put your groundbait in the bag and smooth and twist the bag around the line to expel air. Drop it down to the bottom smartly and the water pressure will hold the bag closed until you reach the bottom. Give it a jerk or two and the bag will open and dump its contents. Then you can wind it back up. This is more environmentally friendly! Have you ever had a series of unexplained breakages with braid line? Maybe it is not a bad batch of line, but a cracked ring liner. Braid is particularly susceptible to damage from abrasion, and even a hairline crack in a rod ring liner is enough to damage the line, making it snap like cotton on even a light load. 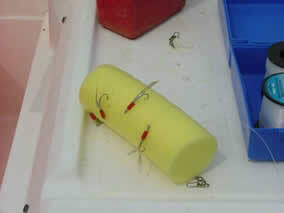 To check your rod rings, take a dry cotton bud and run it round the inside of a dry rod ring. Any tiny crack will snag the cotton fibres and you will find the culprit easily. The only cure is to replace the ring, which is simple enough and relatively cheap – just a bit of hassle. Why is it that the towel disappears just when you have slimy hands and want to pick up your rod? Here’s an idea to keep it handy. 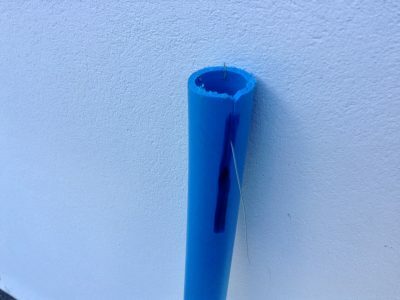 Punch a hole in the corner of the towel, and better still put a brass eyelet in it if you have access to the little tool that does it, and either buy a plastic shower curtain ring or nick one if you think the FPO will not notice. Use the ring to clip your towel to the nearest grab handle or handrail. Then you will never loose it! This is one of those “why didn’t I think of that” ones. When freezing bait, it is important to put bait in a bag and exclude any air so the surface of the bait does not spoil with freezer burn. This works for mackerel and any other freezable bait. First get a bucket full of cold water, then place your bait in the freezer bag. Lower the bag open side up into the water, keeping the top above water level, and the water pressure will squeeze most of the air out of the bag. Zip the top of Ziploc bags or tie regular freezer bags while the water is still squeezing the bag, and remove from the water. Freeze the bag in the fast-freeze compartment and your bait will be stored as well as it can be without commercial kit. Thanks to Arron, who found this idea floating around in his memory bank somewhere.